We are Bangalore based RFID Solution providers for Event Management, servicing the Domestic and International festival and event industry. For over 4 years, the company has developed cutting-edge security RFID technology in form of RFID Cards, Readers, Social Media Branding for various events and since have supplied more than half million RFID Cards to various events. Savinirs Photobug does just that. Our Unique application services can be used to click the photos of various participants of the event and update instantly on their Facebook or other social networking profile. 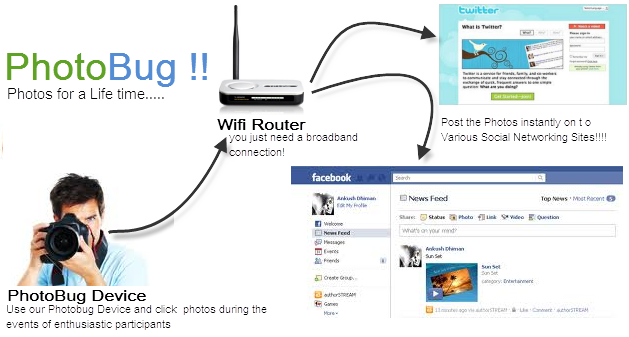 PhotoBug App enables instant photo sharing on digital displays, such as LCD TVs, Projectors etc as well as on Social Media Networks such as Facebook, Picasa, Flickr, Shutterfly etc. The photos can be taken from PhotoBug device and can be uploaded Instantly after clicking!! We Provide all kinds of Pre-printed RFID Card for your Events and for other Official Requirements! We can also provide Cards with Securely encoded Data. We Provide unique solutions, linking your event passes / tickets / RFID cards to the social networks like facebook, google+, twitter etc of the participants thus providing online branding solutions through social networks. We are suppliers of Cards for Event Passes/ Tickets/ Vouchers / Loyalty Cards. RFID Cards, Mifare, Desfare, NFC, Barcode Cards Etc..